A good preparation for Language and Literacy is achieved by helping a child to talk well and encouraging a wide and adept vocabulary. A child needs to be able to concentrate and listen and to have a good grounding in Practical Life and Sensorial exercises. This area is especially designed to develop confidence with pencil control through the use of the insets (shown left). Free-style drawing and painting also encourages emergent writing. 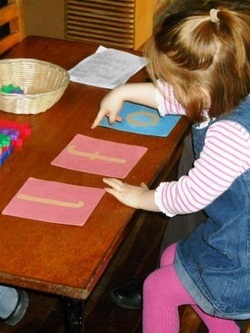 Using the sandpaper letters, children are introduced to sounds using phonetics and correct letter formation in the readiness for writing. Once the sounds of the letters are mastered, then simple, short words can be phonetically ‘sounded out’ and spelled out using the Large Movable Alphabet.